When I decided to do a cosplay of season 2 Listen!! Ritsu from K-On! I knew I wanted to do most of the costume myself. I was most worried about finding a good wig. I knew this after I had gone to several wig shops in the area and found very little in the way of minimal work ei something I could just style or maybe cut shorter. Surprising since she doesn’t have super weird anime colored hair or anything. The problem was also more in finding a wig the could be styled to match her hair. Since it’s not real hair (obviously) that I would be styling it was important for it to be able to be pulled back as if it were attached to a root. It was good to keep this in mind when searching though it limited the selection, as I mentioned. I did find something that would do nicely but it was the not exactly the color I needed. Which meant i was going to need to do some wig dying. I know absolutely nothing about wig dying. And what do we do now a days when we don’t know something? TO THE INTERNET!!!1! One quick search for ‘wig dying for dummies’ gave me the very helpful blog entitled To the Wig Shop!. I quickly learned that dying your own wig any color you want was not a problem at all! I have since found that this method of dying has been posted on many different avenues and tutorial type areas. Cosplay.com has been a good source for many a new cosplayer. At least it’s easily accessible. 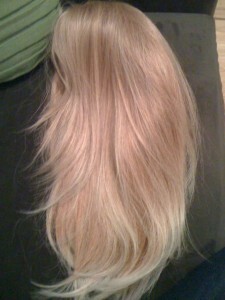 Here are some pictures of the wig I bought before I adjusted the color with the tutorial I found. The light in my apartment has made it a bit hard to tell exactly what color the wig was before. 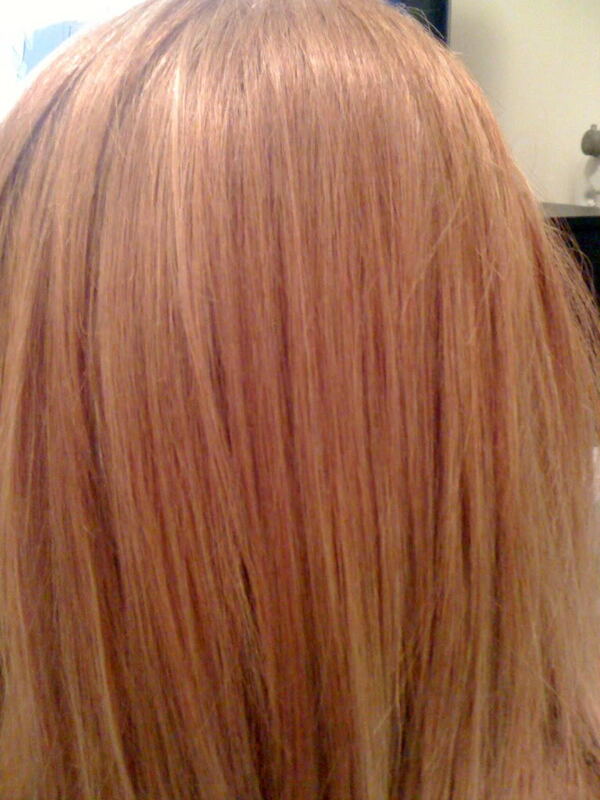 It was a light blonde with some highlights through out, i guess to give it a natural look. The picture on the right is the closest true color picture. You can also see it’s long and if on it would fall an inch or two beyond the shoulders. I chose a longer wig so that I had more control over the length when styling. In the tutorial I linked to, Funnypeculiar makes some very easy instructions. One of which is that you need something you don’t care to stain because it will get stained. To dye my wig I made a new friend! I don’t exactly have an porch or anything to utilize so I set up shop in the hallway, made sure to have plenty of trash bags down to cover any of the dye spray. Once I was ready I just went to town spraying the wig all over. It probably would have been a good idea to spray a little more methodically or to at least have taken care of the under hair first or something. Since the color I was dying to wasn’t completely different (it was essentially a darker brownish blond from an ash/light blond) I wasn’t to worried about missing little spots. Once I was satisfied with my color coverage I let it dry checking on a few hours later just to make sure it was good and dry. I found the wig to be very stiff and well… crunchy. Good in say, chips, not so much in hair. I gave it a good rinsing out out, once again letting it dry. I didn’t take any pictures before I started to style it so I only have a few mid styling pics to show the end resulting color. I was originally happy with it but have since decided that it’s a little light for Ritsu’s hair…. although if I want to just leave it I could. Hair color is a little subjective since it’s not always the same in every pictures and to me Ritsu has a light brown hair compared to Yui’s medium brown hair.